As kids, we’ve been told time and again that life in Africa is hard. Our elders will often tell us to finish our food because people are starving in Africa but our immature self will reply, “Why? Will the people in Africa no longer suffer from hunger if we eat all our food?” Such an immature logic our younger self has back then. What our elders wanted to emphasize was for us to be thankful for our blessings because many others have none. Africa fits the picture to a T. This vast continent is comprised of various nations plagued by poverty, hunger, suffering, and political unrest. Aside from that, many of today’s deadliest diseases had their humble beginnings here. To name a few, there are HIV/AIDS and Ebola. They’re both deadly diseases that have yet no known cures. But today, the picture remains the same. Africa is still ravaged by famine and wars. Have you heard about the famine in the horn of Africa region? Currently, famine has been declared in several African nations and the situation continues to worsen despite government and humanitarian efforts. Despite our modern world and conveniences, millions still suffer and die from thirst and hunger because they lack the resources to improve their lives and catch up with the progress other nations in the world are making. South Sudan, Nigeria, Somalia and Yemen have been facing famine conditions since February 2017. A total of 20 million people are threatened by food insecurity brought on by armed conflicts and the climatic impacts of El Niño. The SDC, which already operates in these four countries, has released additional funding to deliver emergency aid and to expand its development assistance activities. The situation is especially serious in South Sudan where almost five million people are already facing hunger. In Nigeria too, over five million people have no food security and suffer from malnutrition. In 2015 and 2016, the Horn of Africa was hit by a major drought which was exacerbated by El Niño, causing serious crop failures and livestock losses. Since then, more than 11 million people in Ethiopia, Kenya and Somalia are suffering from serious malnutrition. Even with the sharp increase of donors to African nations hit by famine, it is still not enough to keep everyone safe and taken cared of. Regional political tension makes it difficult for the government and other humanitarian groups to access remote areas that need help. Moreover, donor funding is also stretched out as conflict in other parts of the world likewise needs help and support from these non-profit organizations. Africa’s famine does not also get the attention it needs from the international media that could help raise awareness to the problem and increase support from the public. The Western world failed to keep track of African events that they weren’t able to intervene on time to prevent such a widespread famine from happening. 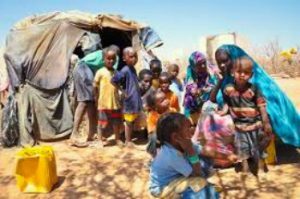 All across the horn of Africa, approximately 40 million people are currently suffering from this famine that is even larger, more serious, and more widespread than the famine of the 1980s. Too little humanitarian assistance was sent too late that death was inevitable for many who weren’t able to survive the early onslaught of the famine. We can expect this severe food crisis to go on as humanitarian support is making little progress in getting to the bottom of this complex issue. For many of us living in the comfort of our modern homes full of modern amenities in a sprawling modern metropolis, it is hard for us to comprehend the extent of hunger and suffering that is ravaging this part of the globe. The numbers are terrifying and they are not just statistics, they are actual people trying their best to cope despite their limited resources. If only more people, especially the leaders of more progressive nations, make their pledges and extend a helping hand to our suffering brothers and sisters, we can put an end to this famine and help uplift their lives and teach them to be self-supporting so they no longer need to rely on others for help all the time.